After blundering into the last stronghold of magic, Carin discovers that she is right to fear the wizard Verek. He is using her to seal the ruptures in the void, and she may be nothing more to him than an expendable weapon. What will he do with her—or to her—when his world is again secure? Or has he erred in believing that the last bridge has been broken? The quest may not, in fact, be over … and Lord Verek may find himself not quite as willing to dispose of his fiery water-sylph, Carin, as he once believed himself to be. Author Spotlight: Castles in the cornfield provided the setting for Deborah J. Lightfoot’s earliest flights of fancy. On her father’s farm in Texas, she grew up reading tales of adventure and reenacting them behind ramparts of sun-drenched grain. She left the farm to earn a degree in journalism and write award-winning books of history and biography. High on her Bucket List was the desire to try her hand at the genre she most admired. The result is WATERSPELL, a multi-layered fantasy trilogy about a girl and the wizard who suspects her of being so dangerous to his world, he believes he'll have to kill her ... which troubles him, since he's fallen in love with her. 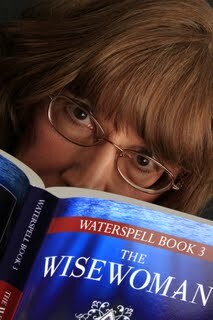 Waterspell Book 1: The Warlock; Book 2: The Wysard; and Book 3: The Wisewoman. What I say (review): I reread The Warlock, book #1 in the Waterspell series before starting The Wysard because I wanted a refresher on the fascinating, yet complex world created by Deborah J. Lightfoot. 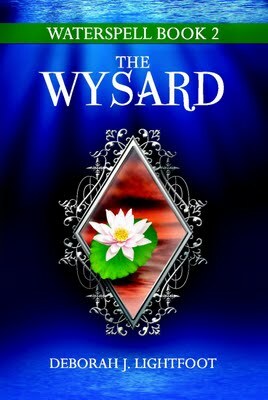 I would recommend reading book #1 first as The Wysard is very much a continuation of the series. The story begins with Carin still under Verek's 'protection' (i.e. as his sort-of-prisoner). Carin, Verek and Lanse are travelling northwards on an unknown mission. As with the last book Verek is still something of a mystery. He ranges between extreme anger and cruelty to being caring and almost sweet. Carin is determined to find out where she belongs and also to figure out what the mysterious message/poem written by Verek's Grandfather in the lost book means. She also wants to learn more about Verek's role in his family's downfall. Lanse is still mistrustful of Carin and is constantly trying to 'off' her. Verek seems torn between wanting to be rid of Carin and wanting to gain her trust. Carin is starting discover more about herself and about the source of wysard's powers. A sweet, fantasy adventure with an old fashioned feel and interesting characters. The heartbeat couldn’t be hers. She was dead. Maddeningly, however, the sound persisted—a strong, steady whump, whump in Carin’s left ear. Through the blackness within her mind, half-formed impressions drifted like moonmist. They teased her with sensations to which she struggled to attach meaning. Her body lay sprawled across a surface that was hard enough to bruise her corpse. But her head and one shoulder rested on matter more yielding. Had her drowned remains come to rest on a rocky ledge in a supernatural ocean? Was this a pillow of seaweed cushioning her skull? No, a thought whispered from a corner of her torpid brain. Seaweed and rock have no heart beating in them. If the heart-sounds were hers, then she wasn’t dead. If the heart beat in another’s chest and she heard it, then she was not only alive, but also pressing very near some other undead being. Her eyes jerked open. They beheld what might have been a rumpled snowdrift bathed in the light of a blood-red sunset. Lucidity flashed through the breach, and abruptly Carin knew: the rumpled whiteness that pressed against her face was Lord Verek’s linen shirt. The reddish tinge on it was no natural light from a setting sun, but the glow from the walls of Verek’s vault of sorcery. The wizard lay on the cavern’s floor of polished stone. Carin lay atop him, her head pillowed on his chest, her ear to his heart, and her slowly focusing eyes inventing wind-drifted snow from the wrinkles of his shirt. She gave a violent start, put both hands to the floor, and heaved herself off Verek’s unconscious body—so forcefully that she nearly toppled back into the ensorcelled pool behind her. She teetered on the pool’s rim, waging a brief, desperate struggle for life. To fall again into those glacial depths would kill her. The intense cold had cast her faculties into an abyss that must have no rival but death itself. Without the sorcerer to drag her up from that oblivion, Carin stood no chance of surviving a second dunking. And her rescuer was in no condition now to extract her from the unnatural waters of his wizards’ well. Verek lay like a corpse. Carin’s sudden movement hadn’t roused him to consciousness. He appeared as lost in the abyss as she had been. She kept her balance. Carin stumbled to safety, treading between Verek’s body and the enchanted pool that imperiled all living flesh, whether mortal or magian. She reached the nearest of the four stone benches that ringed the wizards’ well. Upon that seat carved with the symbol of a fish she collapsed, but she took care to avoid the shape that was cut into the stone. The symbol, precisely centered and deeply carved, might be nothing but decoration. Like its fellows on the other benches in the cave—the image of a key chiseled into the seat across the pool from this one, a radiant sun on the bench to Carin’s left, a crescent moon to her right—the fish might be only a token of magical art. Maybe the four symbols were a wizard’s badge of office, as a king’s crown and scepter were emblems of his royal authority. Or, Carin thought, maybe there’s magic in every line and curve. The events of her three weeks’ imprisonment in Lord Verek’s house had led her to suspect sorcery in all elements of his domain. She distrusted the blighted woodland outside his manor walls and the shape-shifting books in his library. But here in the cave below the library rose the undoubted wellspring of magic. Power flowed in the waters of the enchanted pool and in the lifeblood of the sorcerer who had submitted himself to it. ©2011 Deborah J. Lightfoot. All rights reserved.